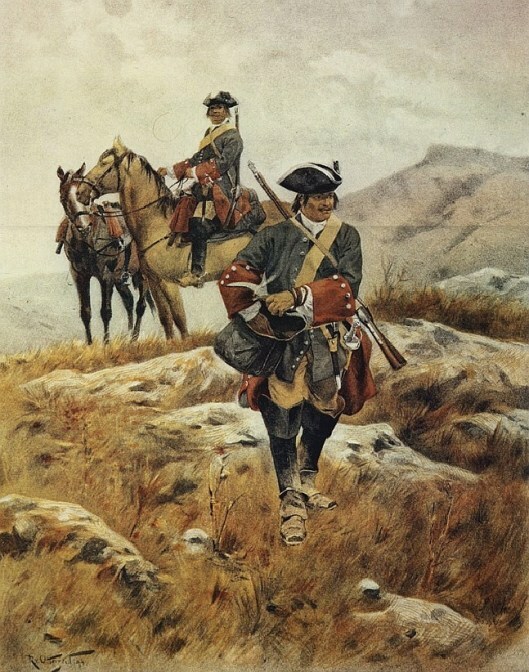 Austria, Grenadier zu Pferde (Horse Grenadiers) 1730 by Rudolf von Ottenfeld. Coalitions in Europe between 1725 and 1730. Signatories of the Treaty of Vienna (April 30, 1725) in blue and signatories of the Treaty of Hanover (September 3, 1725) in red. Prussia, in brown, first joined the Hanoverian Alliance, but later changed sides after the Treaty of Berlin on December 23, 1728. 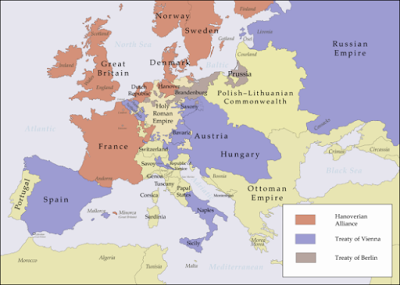 European and imperial politics polarized as Britain and France announced their rival Alliance of Hanover 3 July 1725, recruiting Prussia, Denmark, Sweden and the Dutch Republic by 1727. Britain sought additional bilateral defence pacts to secure Hanover in case of war, while Charles tried to widen his own network. Britain beat him to Hessen-Kassel, offering not only larger subsidies but political support for Hessian acquisition of the fortress of Rheinfels, currently held by a Habsburg client. Most princes, however, preferred a closer understanding with the emperor, especially as the Spanish silver guaranteed the necessary minimum subsidy to make any agreement viable. All four Wittelsbach electors, along with Mainz, Bamberg, Würzburg and Wolfenbüttel signed defence pacts with Austria in the course of 1726. A particular coup was Prussia’s defection from the Anglo-French combination by the Treaty of Wusterhausen, 12 October 1726, confirmed by that of Berlin, 23 December 1728. Princes who held out for too much found themselves spurned by both sides, particularly as Austrian ministers knew they could count on the strong residual loyalty of most rulers should war actually break out. This was the case in Württemberg, where Duke Eberhard Ludwig never seriously wavered from the Habsburg camp despite periodic negotiations with France and Charles’s refusal to grant an electoral title. Even Landgrave Carl considered himself a loyal vassal, although he had agreed to defend Hanover. The case of Saxony was more problematic given Augustus’s dual role as elector and king, but his demands were so unrealistic they found no response from either side: he wanted Bohemia and Silesia as a land bridge between his two states and dreamed of becoming the next emperor. However, the fact that such a comparatively powerful prince as Augustus could not hope to hold a viable middle position between the rival alliances indicated how the German territories were being marginalized by great power politics. Even Austria was ill-prepared for this potentially lethal game. The nominal size of the Habsburg army was raised from 122,945 (1722) to 190,257 (1727), but it is unlikely there were more than 125,000 effectives. In comparison, the French army stood at 229,458 in 1727. Spanish subsidies proved irregular, held up by an English naval blockade, so that only 2.5 million fl. reached Austria by 1729. Subsidy arrears to the Wittelsbach electors alone stood at 4.17 million, and although these were eventually paid, all four drifted back to France by 1729, where they found a better financial deal but still no concrete political gains. Although Austria was strengthened by a treaty with Russia in 1726, it could do little to help Spain, which returned to its Anglo-French alliance at Seville on 9 November 1729. An ultimatum was issued, demanding Charles admit Spanish garrisons into Parma and Piacenza for Don Carlos by 9 May 1730. Despite the mounting tension, the real threat of war was receding due to rifts in Anglo-French relations since 1727. Colonial and commercial rivalry contributed to this as did the conflicting policy of both partners towards the Reich. France’s success in detaching the Wittelsbachs from Austria raised fears that it was returning to its traditional policy of building up a German alliance network. The British government edged closer to Austria, restoring good relations by 1731, when Charles conceded its demands to admit Don Carlos to Parma and Piacenza and dropped his support for the Ostende Company. Though an Austro-Hanoverian alliance was struck on 16 March 1731, a full return to the “Old System” was not possible due to Dutch hesitancy and French care not to let the break with Britain go too far. Nonetheless, the improved international situation restored stability to the Habsburg’s southern buffer zone and enabled Charles to resume a higher profile in imperial Italy by intervening in Corsica. A full-scale rebellion had broken out on the island in 1729 and the Corsicans’ Genoese masters appealed to the emperor as overlord to assist in restoring order. Charles welcomed the chance to enhance his influence in the region, especially as it provided a pretext to increase his Italian garrisons to pre-empt possible Spanish attack. Moreover, the Genoese appeal in April 1731 coincided with extraordinarily favourable circumstances. The emperor was on good terms with Piedmont- Sardinia, a limited defence pact had just been struck with both maritime powers and good relations had been temporarily restored with Spain. Four thousand men were despatched from the Milanese garrison in July to suppress the rebellion. The Genoese, who were paying the expenses, wished to keep the expeditionary force as small as possible, but Prince Eugene urged reinforcements to avoid a defeat. Although numbers had risen to 12,000 by 1732, the local commander saw the impossibility of winning a guerrilla war. Experience in Hungary had taught the Habsburgs the futility of undiluted repression and the necessity of negotiation. The rebels offered sovereignty of their island to the emperor, or, if he refused, Prince Eugene, but the government preferred a less ambitious solution. The Genoese were forced to accept a compromise, decided at Corte on 13 May 1732, promising an amnesty and reforms under imperial guarantee. It seemed the ideal settlement for Charles, reaffirming his prestige as impartial arbiter, but in reality it masked acute underlying weakness. Austrian intervention had depended on circumstances beyond its control, and once these disappeared Charles was powerless to prevent the Genoese returning to their former mismanagement of the island. It was significant that when a fresh rebellion broke out in 1734, its leader, Giacinto Paoli, turned to Spain rather than Austria for help. Nonetheless, it was another German who would be king, Baron Theodor von Neuhoff, who was chosen as monarch in March 1736. His reign lasted only until October, when he left to find further assistance and promptly landed in a Dutch debtors’ prison. Unable to intervene because of the Polish and Turkish Wars of 1733-9, Charles remained only a nominal partner in an unusual Franco-Austrian expedition to crush the rebellion in February 1738. Anxious lest the French remain in permanent occupation, Genoa pressed Charles to send his contingent, but nothing was done before the outbreak of renewed European war in 1740 compelled Louis XV to recall his troops. Poland, where Augustus was frequently ill after 1722, raising the question of his succession. Austria and Russia were not well disposed towards backing another Wettin candidate, despite Crown Prince Friedrich August being Charles’ brother-in-law. Russia in particular cast about for an alternative to assist its Polish policy, initially lighting on Prussia, its only loyal German ally at the end of the Great Northern War. Treaties were struck in 1720 and 1726, securing Prussian support to keep Poland weak and prevent the succession of a monarch not of Russia’s choosing. The Austro-Russian alliance of 1726 upgraded Russia’s German partner to none other than the emperor himself, forcing Prussia into second place. Although the three did agree to co-operate in the Alliance of the Three Black Eagles of December 1732, it was Austria and, increasingly, Russia that called the tune. Frederick William I was forced to concede Russia a free hand in the future of Courland in return for retaining some influence in Poland after 1733. The most decisive agreement, however, was the Löwenwolde Convention of 19 March 1733, whereby Austria and Russia agreed to back the Wettin candidate for want of a better alternative following Augustus’s death on 1 February. Charles increasingly lost control over events as Russia and France moved towards war. Empress Anna and her ministers were keen to settle matters in Poland quickly to be free to turn to more ambitious projects in the Balkans, forcing Charles to commit himself or lose their support altogether. Though Cardinal Fleury wanted to avoid an open breach, Louis XV pushed the candidacy of Stanislaw Leszczynski, partly from personal sympathy for a man who had become his father-in-law in 1725, and partly for want of a better candidate. Leszczynski, who had spent the intervening 20 years in French exile, had become something of a Polish national hero, helped by a series of bungled Saxon assassination attempts and by the fact that his countrymen had had time to forget his failings. The resultant conflict proved a severe test for Charles’s defence strategy, as it involved three interrelated struggles in the sensitive buffer zones of Poland, Italy and the Rhineland. Although the situation had been stabilized by 1735, the Habsburg monarchy was seriously weakened by a conflict the political importance of which far exceeded the level of actual fighting. If Augustus had embarked on his royal adventure from a poor position, that of his son was weaker still. The Saxon army totalled only 19,800 men in June 1733, and even with 4,000 extra conscripts was completely incapable of enforcing Wettin rule alone. Field Marshal Lacy and 30,000 Russians crossed the Polish frontier on 11 August, their operations subsequently held up not by Polish resistance but Empress Anna’s doubts as to whether she was backing the right candidate. France declared its support for Leszczynski on 4 September, and he was elected by the majority of Polish nobles eight days later. Louis XV declared war on Austria and Saxony on 10 October, spreading the war in support of his father-in-law three days later with simultaneous attacks on Kehl and Lorraine. However, a minority of nobles had already chosen the Saxon elector’s Augusts II, as their King Augustus III on 5 October, and with Russian assistance Leszczynski’s rule was restricted to the area around Danzig. France was unwilling to assist directly beyond sending 2,500 troops, who had already surrendered to the Russians on 23 June 1734. Fleury was only interested in securing Poland as a French Barriere de l’est provided it could be done without diverting resources from more important objectives. The fall of Danzig to a Russo-Saxon force on 9 September ended Leszczynski’s second brief period as king and he temporarily found refuge in Königsberg, as Prussia had little desire to help its Saxon rivals. By this time the war had also spread to Italy, as France, allied to Sardinia and Spain since 1733, sent 38,000 troops to attack Milan in late October. Joined by 25,000 Sardinians, and eventually 24,000 Spanish, these proved more than enough to drive the 18,000 Austrians out of Milan. The situation stabilized with the arrival of Austrian reinforcements from spring 1734, fighting the allies to a standstill in Parma and Mantua. However, Charles’s troops were unable to prevent the Spanish moving south past Rome with papal permission to attack Naples in May 1734. Held by only 21,000 men, this was quickly overrun, followed by Sicily soon thereafter. The situation would probably have been even worse but for the conflicting aims of Austria’s enemies. Sardinia and Spain both claimed Milan and nearly came to blows over Mantua. France was concerned to limit Spanish resurgence in Italy, while Sardinia wanted to retain at least a token Austrian presence there. Charles’s inability to defend Habsburg Italy was due in part to the need to divert forces to hold the Rhine, vital to sustain his prestige as emperor. All elements of the formal and informal defence structure were activated to assist the limited Austrian forces. The Association mobilized, agreeing a triple quota on 9 November 1733, followed by the declaration of a full Reichskrieg by the Reichstag on 9 April 1734 and the extension of the mobilization throughout the Reich. Meanwhile contingents had started to arrive in response to Charles’s network of bilateral treaties, which were extended by supplementary military conventions and fresh agreements. Charles carefully targeted princes with influence within the Kreis structure to ensure his bilateral arrangements complicated the Association’s mobilization. The Franconian executive prince, the influential imperial vice chancellor, Friedrich Carl von Schönborn, agreed extra Bamberg and Würzburg auxiliaries in addition to promoting Kreis mobilization. Swabian co-operation was consolidated by a treaty with Carl Alexander, the new Catholic duke of Württemberg, who was already well integrated into the Habsburg patronage network. Hessen-Kassel was also persuaded to rejoin the Upper Rhenish Kreis military structure in addition to providing auxiliaries, while the agreements with Hanover and Wolfenbüttel also ensured they fielded their contingents to the Reichsarmee. Significantly, Prussian aid was secured without conceding Frederick William’s demands for Jülich-Berg, and, to reduce the king’s bargaining power, Charles rejected his offer of 40,000 men, accepting only the 10,000 he was obliged to provide under the Treaty of Berlin. The other rulers also received little material reward for their efforts and were obliged to reaffirm their support for the Pragmatic Sanction and often provide additional recruits directly to the Austrian army. Charles’s defence of the Rhine was affected by international developments. His relative success in securing German support was due in part to the absence of foreign competition. Unlike previous wars against France, Britain and the Dutch remained neutral because Fleury wisely refrained from attacking the Austrian Netherlands, negotiating a treaty to this effect with the Dutch Republic in 1733. Though German auxiliaries were not drawn to Flanders by Anglo-Dutch subsidies, this also meant there was no extra money for help in Italy. Charles could not hope to match the sums formerly paid by the maritime powers, but without additional money the princes could not mobilize more troops. As it was, many preferred to retain their remaining units for home defence, such as Ernst Ludwig, who refused to release his guard dragoon regiment on the grounds it was needed for his own outposts. Shortage of funds compelled Charles to accept cash in lieu of troops from the weaker Westphalians and Lower Saxons, further reducing the effective strength of the Kreis contingents. Though the paper strength of the Austrian army was raised from 141,713 (1732) to 205,643 (1735), no more than 157,000 were actually present, making German help crucial. Moreover, the absence of a Netherlands front enabled the French to concentrate up to 100,000 of their 280,585 troops in the Rhineland, in addition to sizeable numbers in Italy. These were more than sufficient to achieve Fleury’s limited objectives of weakening Habsburg Italy and annexing Lorraine. The latter was quickly overrun after 13 September 1733, reducing the remaining French operations in the Rhineland to pressurizing Charles into negotiating. Since France could not strike at Austria, it was compelled to attack German targets, but had to limit these to symbolic objectives, such as capturing the Reichsfeste for fear of antagonizing the princes and provoking Anglo-Dutch intervention. There was no repeat of the savage devastation that characterized Louis XIV’s policy, and once Kehl fell on 28 October 1733, French forces withdrew over the Rhine. However, this failed to deter German mobilization, forcing the French to launch an attack down the Moselle valley, taking Trarbach and Trier in April 1734. A second force then broke the Ettlingen defensive lines in May, forcing the newly-assembled Reichsarmee under Prince Eugene to retire on Heilbronn and clearing the way for the siege of Philippsburg, which fell on 19 July. Thereafter, France remained on the defensive, refraining from provocative attacks deeper into the Reich. The question of Russian intervention hung over these operations from the outset, as Charles called on Anna to honour her obligations under the 1726 treaty and send the promised 30,000 men. Anna refused until her ministers had manoeuvred Charles into agreeing to back an offensive war against the Turks, which the Russians started in 1735. Even then, she unilaterally reduced the assistance to 13,000 and directed it to the Rhine rather than Italy, where Habsburg strategists originally wanted it. France and Bavaria quickly exploited the Russians’ westward advance from Poland for propaganda purposes, raising the image of barbarous Moscovites as henchmen of imperial absolutism and referring directly to their earlier disorderly conduct in Mecklenburg. In fact the Russians were on their best behaviour, since Anna and her advisers used the expedition to boost their international prestige. Trained and disciplined largely along German lines, the Russians made an impressive appearance as they arrived in Swabia that August. Apart from language problems and cattle plague spread by transport oxen, the Germans had no difficulty coping with their new guests. The Russians’ arrival raised hopes in Vienna of turning the tide of war, and some planned to use the Bavarians’ opposition to their transit as an excuse to invade the electorate and disarm its army. However, Prince Eugene continued to regard the situation as hopeless, arguing that it was impossible to take Bavaria without a long and costly campaign. Even with the Russians on the Rhine he felt unable to take the offensive, claiming Anna’s assistance came at too high a price and peace was a better option. As it was, the Russian advance did alarm the French, who opened negotiations with Charles in June 1735 when it became obvious that diplomatic efforts in St Petersburg had failed to deter Anna from intervening. Peace preliminaries were signed in Vienna with British mediation on 3 October. France compelled Leszczynski to abdicate in favour of Augustus III and accept Metz, Toul, Verdun and the duchy of Bar as compensation. Lorraine would also be transferred to the ex-king once its current duke could have Tuscany after the death of the last Medici, which occurred in 1737. This paved the way for full French annexation of Lorraine along with Leszczynski’s other territory upon his own death in 1766, completing Fleury’s programme and ending Lorraine’s association with Germany until Bismarck’s Second Reich in 1871.